A compendium is a collection of things. And, in the case of KAIJU! 's 2016 GABS beer, it's a collection of many of the things they love: hops, malt (seven varieties) and booze. But this time there's a new (at least for them in the commercial sense) thing too: the addition of a Belgian Abbey yeast for added fruitiness. 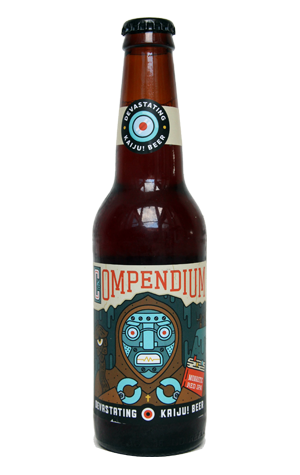 As a result, they're calling it a Monastic Red IPA and have slapped a robot monk on the label (becoming the second hero, as opposed to kaiju, to appear on a KAIJU! label). As with their 2015 GABS beer, Betelgeuse, they scored a top ten finish in the People's Choice vote – one of only two beers in that ten not to be based on food – with the full-bodied beer delivering the sort of rich, sweet complexity you might imagine from such a concept. Look out for the likes of mint, sherbet and ginger nuts on the nose, plus jaffa orange, spicy fruity punch and treacle flavours as well as a fruity, herbal tablet finish quite distinct from the more typical KAIJU! bitter thwack.